Dhaka, 19 August, Abnews: Buyers are flocking to the cattle markets in the city as only three days are left for Eid-ul-Azha. As many as 25 cattle markets have been set up in the capital. Of them, 15 markets have been set up in DSCC and 10 in DNCC. Veterinarians are performing physical test on cattle and other animals to maintain healthy practices in the cattle markets. Animal loaded trucks are entering Dhaka city every day from across the country. While talking to the news agency, city dwellers said despite availability of huge sacrificial animals in the markets, prices are much higher than that of the past year. About higher prices of sacrificial animals, sellers said prices of animal foods as well as other costs including transport have increased sharply. Although the trend of selling is low, they are hoping that sales of animals will increase in the next two days. The government has taken adequate security measures for smooth trading of sacrificial animals in the markets set up in different points in the city. An official of the DSCC said that the number of temporary cattle market may increase due to availability of open space, while the DNCC authority may give approval for setting up two more makeshift cattle markets on the occasion of the Eid. 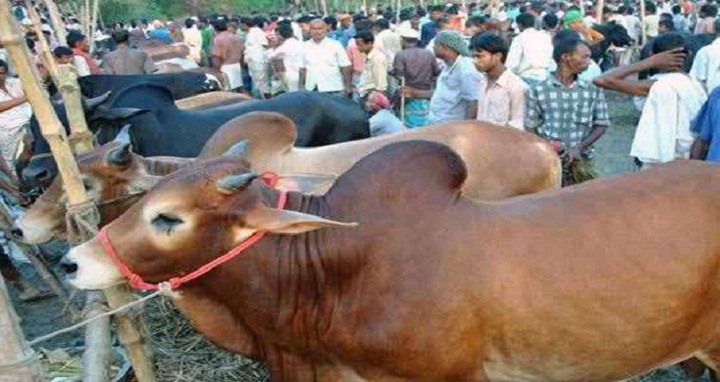 According to the city corporation officials, the cattle markets of DSCC are located at Meradia Bazar at Khilgaon, Moitri Shangha ground near Rail Gate Bazar at North Shahjahanpur, Jigatola-Hajaribagh ground beside Leather Engineering College, Rahmatganj Playground at Lalbagh, Armanitola, Shyampur Balurmath at Kadamtoli, Sadek Hossain Khoka Ground at Dholaikhal, Dhupkhola East and Club ground, Balurmath adjoining Brothers Union at Gopibagh as well as the free spaces adjoining it, Kamrangirchar Islam Chairmanbari, Postogola Shashanghat, Donia College playground at Jatrabari and the free spaces adjoining to Kamalpur Stadium near the Kamlapur Railway Station.